Notes from MDC — Manderley Design Co. Creating spaces where people thrive! This living and dining room redesign was for a client that had recently bought a house built in the late 90's, and was very "fake Tuscan", as we joked when the project started. Our first step was to uncover the heavily draped windows and let the sunshine in! After selecting lighter, up-to-date paint colors and new flooring, we brought in furniture perfectly proportioned for the large room with high ceilings, and lots of soft texture to make it cozy. Fun accessories and statement lighting are the finishing touches. Check out the rest in our portfolio! More here. Photos by La Luz Photography. I'm so happy to finally share a beautiful master bedroom that we designed for some clients that really needed more light in their life! Their home is on a dark, forested lot, with gorgeous old growth trees that are great until you want the sun to shine in. Our main goal with this room was to lighten up! We revamped the window wall in the master by adding a double French door with full length glass, and then we selected furniture that would really shine in all the new light coming in. The white lacquered nightstands and oversized mirrors bounce the light around and multiply it. Success! We kept the palette soft so that the room would be restful and peaceful, but included touches of more intense color here and there because the wife adores bright hues. We love the palette of soft blues and grays, accented with orange, navy, and turquoise. Some of the finishing touches are texture (on the grasscloth covered dresser, wool pillows, rattan basket, cozy wool throws) and personal treasures. The driftwood was a momento from a recent vacation that the couple took to celebrate an anniversary; a beautiful carved box is a family heirloom; and sparkly jewelry now adds sparkle to the room when it's not sparkling on an arm. All photos except 2 and 7 by La Luz Photography. We seem to do Thanksgiving a little backwards...we celebrate with family the weekend before, and then head to a dear friend's beautiful barn for the actual holiday. Her grandfather built the barn in the 1940s, and it makes the holiday feel a tiny bit like we're pioneers having a community Thanksgiving in the neighbor's barn. But that's a story for another time! 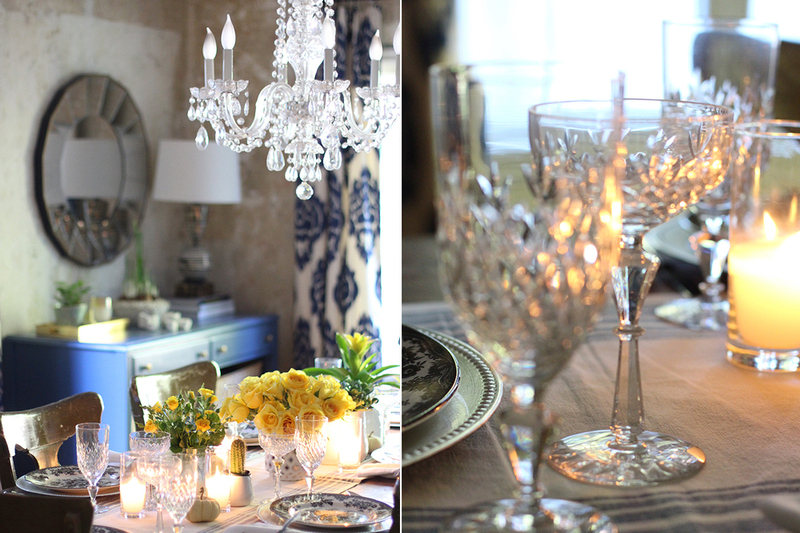 Today's story is about the table I set for our family dinner a few days ago. I never seem to use traditional Thanksgiving colors. I still haven't lived down the year I did bright purple and grey! It was so lovely, with lots of calligraphy, antlers, and sparkle, but some people in the family just didn't get it. This year I went with black, blue, and bright yellow. I wanted to pick up the shades of blue in our dining room furniture and drapery, and use some blue and gold ribbon I bought in France a few years ago. I usually use my black transferware "Asiatic Pheasant" plates at Halloween, but forgot about them this year and didn't want a year to go by without them making an appearance. I had a lot of yellow flowers and plants around for a photoshoot, and I loved the vibrant shot of color they brought to the table. The vintage silverware was my grandparent's wedding silver, and my waterford goblets were my mother's. I love using family heirlooms because it feels like all of those people from the past are present at our meal. I think Hayes is going to be the one that carries on this tradition, because even though he is all boy, he loves it when the sparkly dishes and glassware are out! Happy Thanksgiving to you and yours, whenever and wherever you celebrate. We have so, so much to be thankful for. 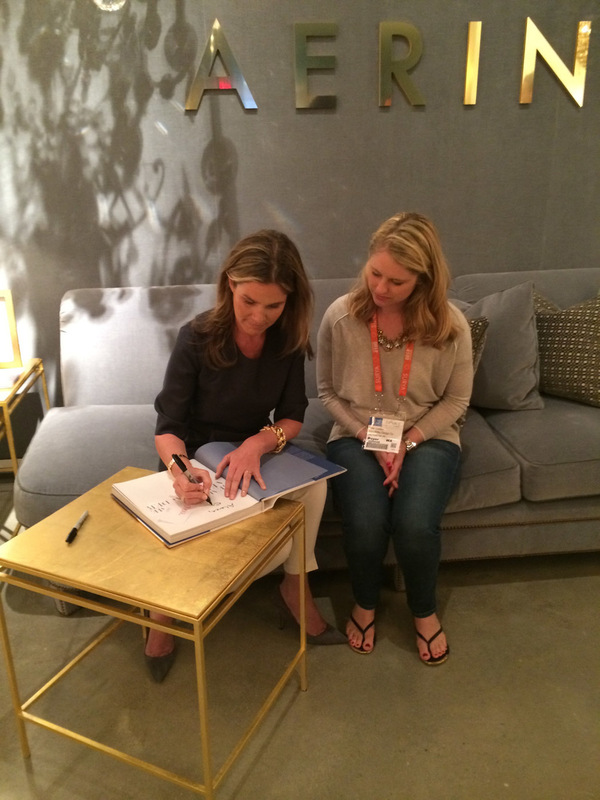 Best of High Point Market! 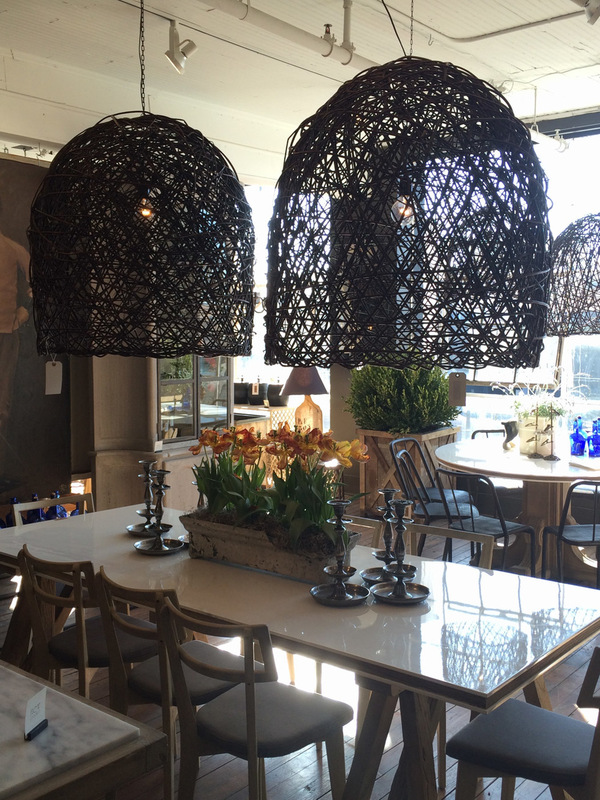 High Point Market is the Fashion Week of the interiors world. Twice a year, furniture, lighting, rug, and art (and everything else you can think of for interiors!) manufacturers gather in High Point, North Carolina to show off their new offerings. Literally thousands of designers, buyers, stagers, and retailers flock to this normally tiny town and the population swells exponentially. It's actually a very strange experience to witness what happens to the town dynamics, but I'll leave that to the sociologists. I find it fascinating though! 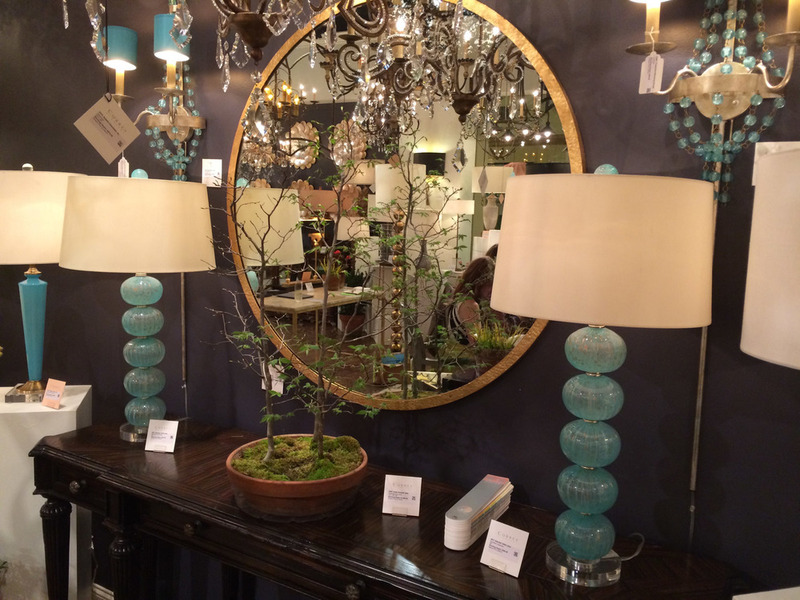 For this best-of-market Spring 2014 edition, I'm sharing my favorite pieces, trends, and vignettes. Enjoy! And don't hesitate to contact us for more info about ordering anything you fall in love with. These to-the-trade items are available through Manderley Design Co! Most of the big showrooms are in large convention halls, but there are some lovely little shops with lovely storefronts along the sidewalks. First stop is Bobo Intriguing Objects. The perfect name...they have a beautiful old warehouse stuffed with interesting and sometimes very strange objects. Here is an important design lesson from them - chandeliers can never be too big! Books! That might need to be organized a little. But this is why I love BoBo! I really do. not. get. these. Love the shape of this chair at Bobo! On to one of the big exhibit halls! I love the art work at Pheromone. They have agreements with zoos to acquire their insects, birds, lizards etc. that have passed away, and they use them in beautiful collages. 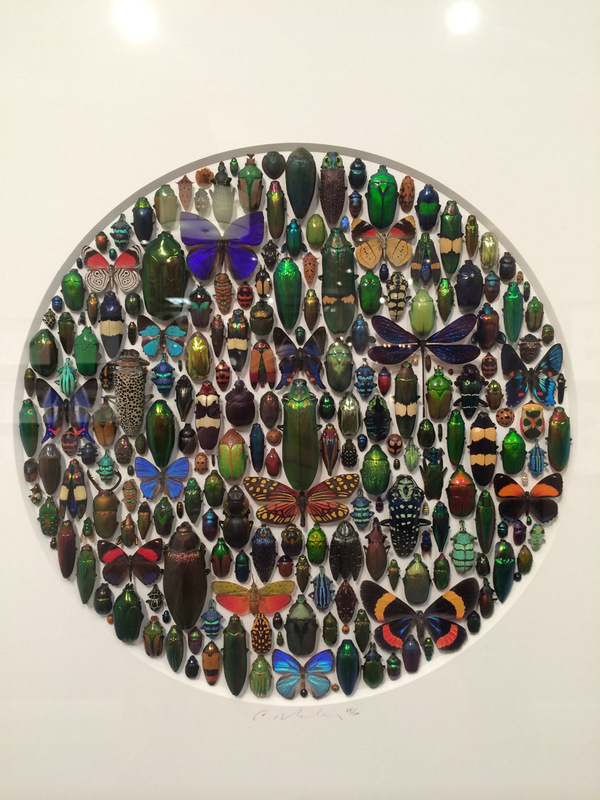 I love that the animals' beauty lives on for a while longer. 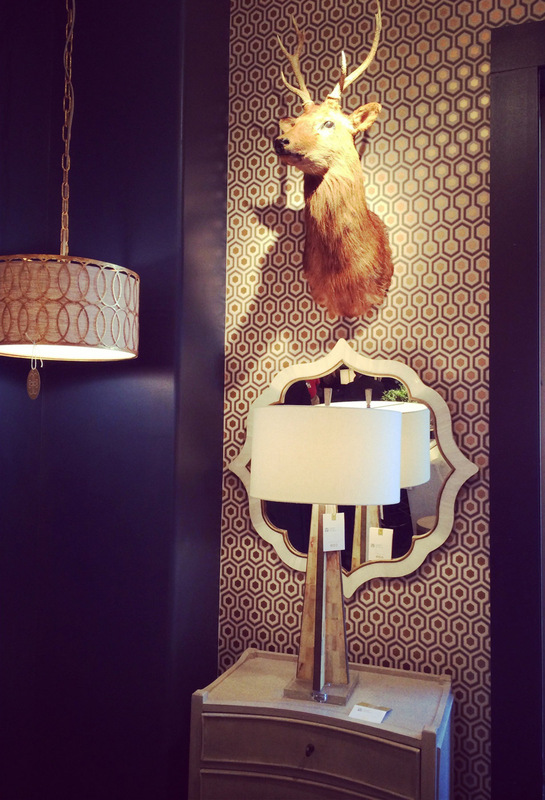 Great little vignette with fantastic wallpaper and a gorgeous mirror at Gabby. Oly is one of my very favorites. 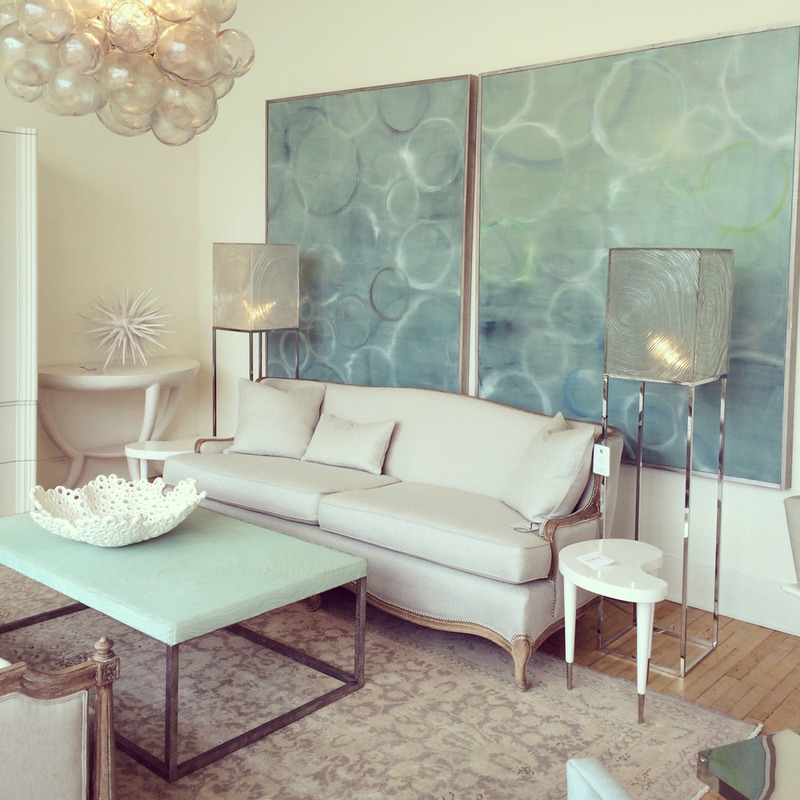 Their showroom is dreamy perfection with soft colors, lots of gold and silver, and the most elegant but creative transitional furniture. And I could happily live in the cute courtyard outback. Lo Forti is a family owned business that makes the most beautiful hand-colored prints on fine paper. Check out the detail on these. The cute little octopus and coral came home with me! Some of the showrooms are in an old factory, and they've preserved the view as you walk through a breezeway. A great piece from England. 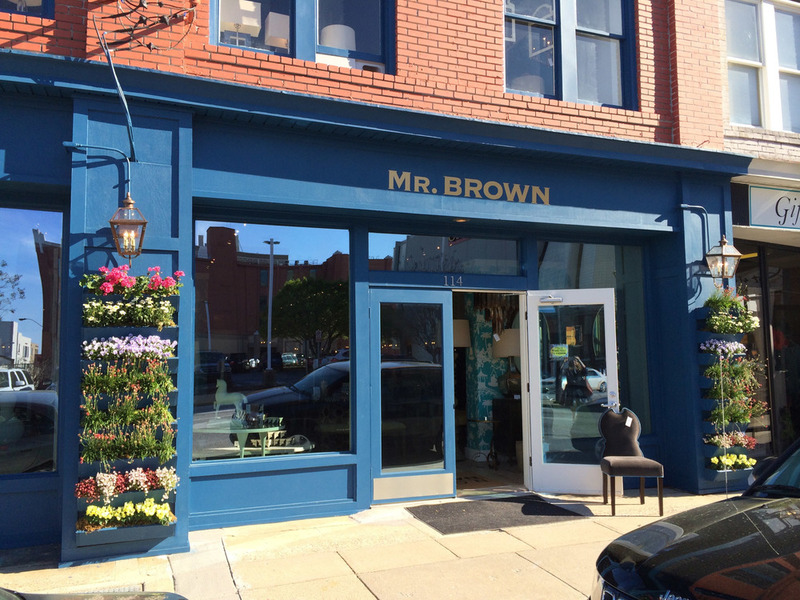 Speaking of England, Mr. Brown London is a favorite stop. I adore their store facade with the bright blue planters of ingenious design. Time for mojitos at Mr. Brown! 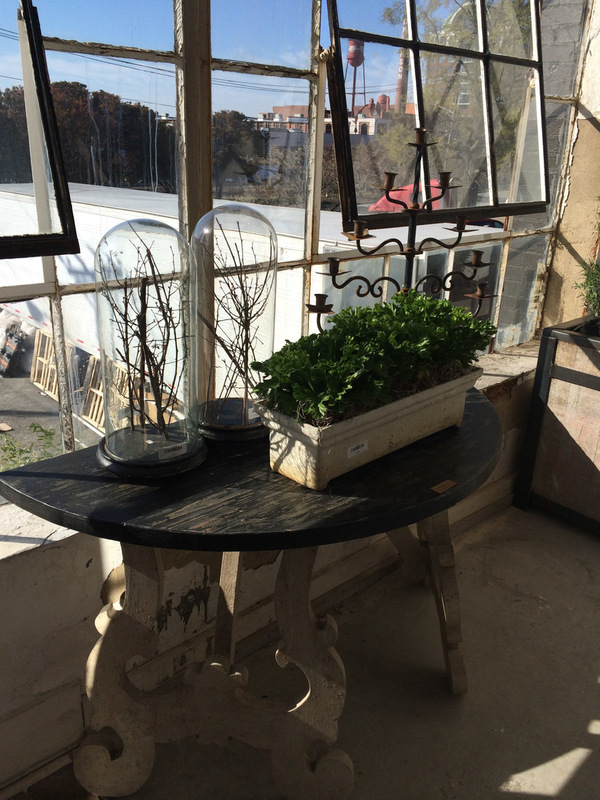 A beautiful vignette at Currey and Co. They have the best lighting with interesting new shapes and materials at each market. Mr. Currey is always at the show with his big shaggy standard poodle and tons of organic produce from his garden that that chefs whip up into a big buffet three times a day. Their southern hospitality makes them one of my favorite and most frequent stops! 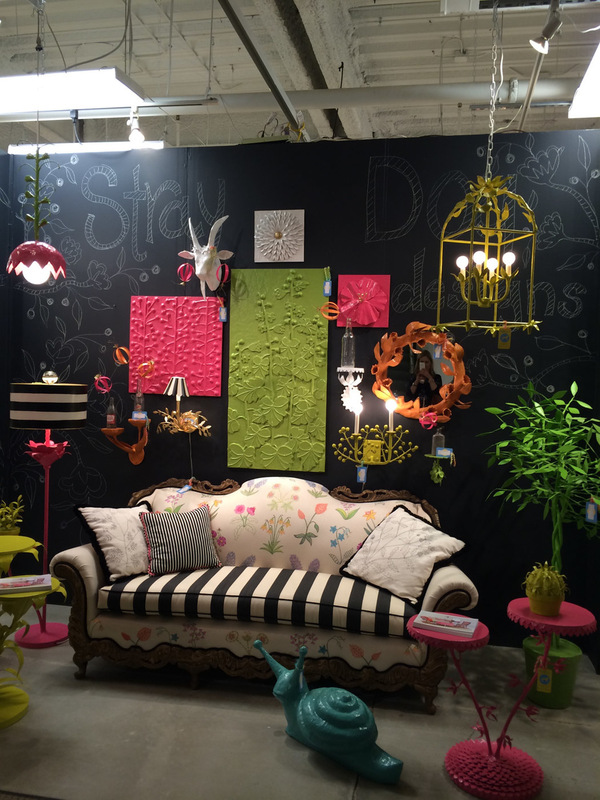 I love the whimsy and color that Stray Dog Designs incorporates into their paper cache lighting and accessories. Just hanging out with Aerin Lauder, the lady who designs killer shoes, while I wear rubber flip flops because me feet are shredded tatters by this point! Oh, she is so beautiful and elegant. 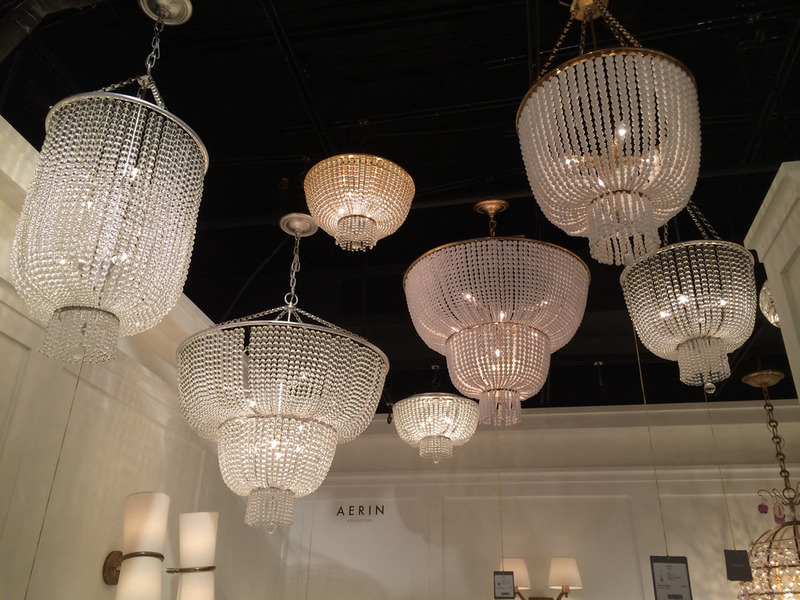 Some of Aerin's beautiful lighting for Visual Comfort. Last stop...Waffle House! I can't leave without a sausage grits bowl with fried egg on top. You just can't find them in Seattle. And finally, the PEACHOID for you House of Cards fans. I was so excited the first time I drove past this. It's everything they said it was and more.